Christmas cactus help needed ... still no blooms ?! 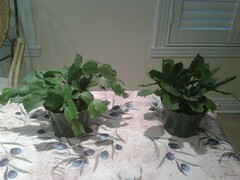 I have these two christmas cactus purchased last year and of which had small buds which eventually bloomed at x-mas time. I kept the same pots and a watered them normally throughout the year and the plants looks healthy and strong. Should I be expecting buds soon as it's mid-november and nothing yet? Two suggestions: Have you been fertilizing them? They need to be fed to bloom. Also being winter bloomers, their blooming is triggered by short days, long nights. They need at least 13 continuous hours of darkness daily for a period of months (well at least 6 - 8 weeks) to trigger the blooms. If they are in the house and there is artificial lighting around them, put a box over them or stick them in a dark closet, every night. Cut down the amount of water, be sure you let them dry out before watering. But mainly the darkness. Should I just put them in a dark place now ? So no harm in moving them. You can just stick them in a dark closet. More ideally you can treat them like a parrot... put a box over them in the early evening that you remove in the AM, so that they get the long dark nights, but still do see some daylight. Mine are blooming now (Thanksgiving Cactus?) I believe they also like cooler temp to trigger blooming. I have them on a single glazed Southeast window sill where the room light is hardly ever turned on. I believe what sunlight they get should be at least East or West window. Southern exposure seems to be too strong (at least in the summer time) unless you acclimate the plants first. WAIT! It sounds to me like you're planning to put the plants in the basement 24/7, are you? You want them to experience daylight (lots of daylight) during the day, and darkness during the night. Just want to make sure. Also, for MY cactus, the darkness bit wasn't that critical since I do keep a plant light in that room and it's on sometimes until bedtime, and the hall light shine into the room at night. Definitely not as fussy as Poinsettias. By basement i meant in a cooler room with some windows , therefore light in day and complete darkness at night.